In order to improve the accuracy of results using a partial SSN, CMS now requires that the four remaining data points must be an exact match to determine whether an individual is a Medicare beneficiary. 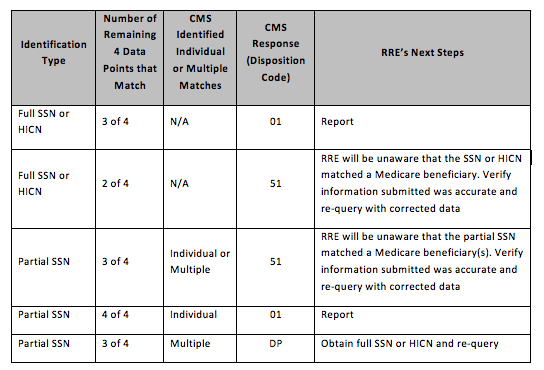 If CMS can identify a match, using the partial SSN and the four additional data points, the RRE will receive a “01” disposition code (“Medicare Beneficiary”) response. In the event that more than one record is a match, CMS will respond with the “DP” disposition code. If this occurs, a full SSN or HICN should be obtained and the individual should be re-queried in order to resolve the duplicate matching issue. Records where the partial SSN matches a Medicare beneficiary, and fewer than four remaining data points are an exact match, CMS will reply with a “51” disposition code (“No Match”) response. However, a No Match response does not relieve the RRE from their reporting obligation. The RRE must do their best to ensure that the data points submitted are accurate and delve further into the matter, especially if they have reasonable suspicion that an individual should be Medicare entitled (i.e. receive a “No Match” response for an individual who is over the age of 65). The matching criteria for HICNs and full SSNs will remain the same, allowing a match with three of the remaining four data points to determine the individual is a Medicare beneficiary. To simplify some of the possible CMS query response scenarios, please see the table below. In each scenario it is assumed that the Identification Type matched a Medicare beneficiary(s) in CMS’ system. RREs are still encouraged to obtain a HICN or full 9-digit SSN in order to guarantee the most accurate match. If the RRE is unable to obtain a SSN, HICN, or any of the information above, they should document the file with their efforts to secure the information. The Garretson Resolution Group continues to monitor developments at the CMS and will report future developments. For more information about this announcement and other MSP compliance services, please visit www.garretsongroup.com. To view the original CMS Alert, please follow the link here.